1:46 What should a business do following an accident? 10:14 What is the next step after reporting has been completed? 14:05 What rights does the regulator have to request your report given you could be hanging yourself? 15:36 The ONLY WAY TO PROTECT YOUR INVESITGATION report from the regulator. 19:42 What is ‘reasonable’ access to you business? 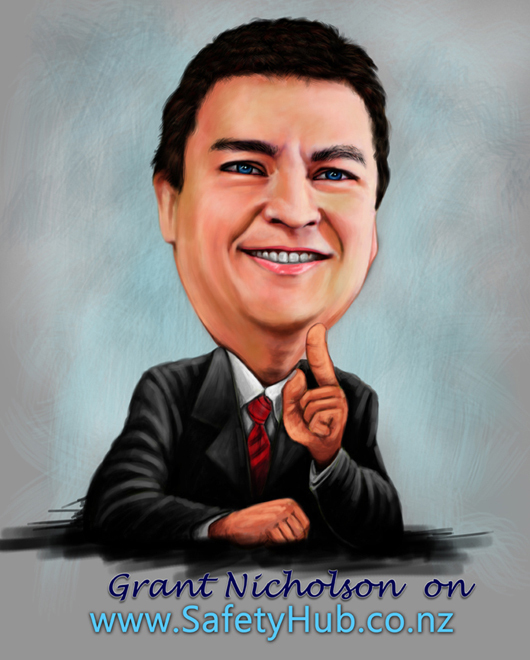 know New Zealand H&S lawyer Grant Nicholson. How are you going Grant? Grant: Very well, how are you? Tony: Good thanks. Look Grant is a partner with Kensington Swan and I’ve heard Grant give a really great presentation a couple of years ago, around the whole process of investigation of a workplace incident, which could ultimately wind up in a court situation, and what you as a business should be around managing this whole process. So that’s what we’re going to talk about today and focus on a workplace accident scenario. Are you happy with that topic Grant? Grant: Perfect Tony, ready to go. Tony: OK, lets say in a business out there and accident’s just occurred, and they’ve worked through their emergency response plan and the people that are injured are now getting their medical treatment and the site is secured, so no more people are going to be injured. And people will now start to turn their mind to their legal requirements. So, what should a business be doing from this point on? Grant: The first thing they should do is assess if serious harm has occurred and there is a statutory definition in the Health and safety in employment act. But basically you can almost follow your gut instinct. If it’s anything more serious where somebody’s had something chopped off or whether they have been taken off to hospital and they are likely to stay in hospital for a period or they become unconscious. Those would be common indicators that you have had serious harm. If people are not sure if they’ve had serious harm or not they can go online and look at legislation.govt.nz, that has the HSE Act on it and they can look up the definition which sits in Schedule 1 to the Act and get a sense for themselves. Or they can contact a lawyer to ask whether in fact they have any obligations under the Act in relation to the accident. That may seem like it is self evident but I did, a number of years ago now, have a client had a worker working on a construction site with a nail gun. And he fired the nail gun and the nail rebounded from a very strong surface and embedded itself in the guys lung and they rung to say well that doesn’t sound like serious harm to them and I had to say more or less, terribly sorry but actually it is. So don’t always trust your gut on that. The reason that whether it’s serious harm or not is important is because if it is serious harm, there is an obligation to report to what is current known as the Ministry of Business, Innovation and Employment, which was formally the Department of Labour and in a few months time about to be known as Worksafe New Zealand, as the prime regulator. And you need to make an oral notification as soon as possible. In large centers like Auckland, Wellington or Christchurch you will normally get a few hours before reporting becomes an issue to the Ministries 0800 call center, but in smaller centers particularly in provincial towns are notorious for this. What often happens is if you’ve called the ambulance to look after somebody the emergency services will take on themselves to call either the Police and or the local Inspector and what happens is firstly you lose control over the process and who is saying what to whom. And also run the risk of an inspector taking umbrage at the fact that haven’t notified as properly as you might, and also run the risk of an inspector turning up on site before you are ready for them to be there. Once you’ve done that and working on the basis that the scene is secure, on a practical level there are two things that you need to do. The first of those is to just think about employee assistance to not just the person who is injured. But actually towards their work mates as well as anybody who may have actually witnessed the accident or otherwise be affected by it. You’d be surprised how often that is a material concern particularly when you’ve got more significant injuries. And I’m thinking about not just fatalities but actually cases where people may have actually seen one of their work mates potentially lose a limb or have fingers or a hand de-gloved, for example, so you see some pretty messy, for want of a better term, accidents where the people left behind are going to need support. Because the person who is a victim is also a friend, or a workmate and even if it’s a contractor or sub-contractor situation, it’s going to be someone that they sat down with at smoko and had a cup of tea or coffee with. Perhaps had a cigarette so it’s going to people that they know and so one of the first things to be thinking about is can anybody else safely go back to work. Or are they going to be distracted and do we need to be thinking about what we can do for all of them. As well as having an onsite communication plan around what you are going to be telling people because on larger sites you are going to have a large number of people who are not necessarily going to know that there has been a serious accident happen. Until the jungle drums tart beating around the site and all of a sudden you’ve got a lot of people who are hearing part of the story but not the full story and who will have a lot of questions about what is going on. More importantly you’ve also got to be thinking about what you are going to be telling more senior management for larger business. Or particularly businesses where you’ve got more than one site, and where you don’t have the ultimate bosses, on site working where the accident occurred. They are going to want to be notified to what’s going on and thinking about whether there is any sort of PR or media support. Particularly in any incidents that are high profile even when it may be small contracting businesses. Often they will be involved working with larger organisations and again, provincial centers tend to this is more an issue for them rather than the big centers. But where there is not much news going on, reporters from the local press are very good at having local contacts with the police and ambulance and fire services and sniff out that there might be a story splash to their editor to put into the local paper for the next day. And companies need to be thinking about what is it that they are going to do in terms of offering some sort of public comment. And generally speaking, I tell them look, say some sympathetic things about how awful it is and how you are looking after the victim and doing everything to protect and support the other employees otherwise it’s inappropriate to comment until the investigations, internal and external, have been completed. Tony: There is a lot of information there and it sounds to me that the key thing, we talked about reporting, reporting requirements, the oral the written, but then moved into potentially having a communication plan already thought through. Who are you going to talk to, whether you’re a large business, or a medium business in a large city, or are you rural so, the sense I’m getting from the first opening statements there is that preparation is key, even before an accident. Grant: Look absolutely right and look if you talked at the outset about companies starting to implement their emergency response plan and really the best example I can give you of that is Pike River Coal. With the Pike River Mine Explosions in 2010, where they had an extensive range of roles that were identified, they had done some training drills, so that people who were likely to have roles in the case of an emergency actually knew what they were supposed to be doing. There were only two very significant problems with the plans that they had. One was that they didn’t give any consideration in the emergency planning to what happens if you have someone in a senior position that may actually be caught up in the emergency. Or in the case of Pike River where you had the National Health and Safety Manager for Pike River Coal whom had two sons trapped in the mine. Well obviously that immediately that took them out of play in being able to participate in the implementation of the emergency response plan because he had more pressing personal concerns to attend to. But you also had situation where, in the Pike River Royal Commission came to look at the problem, they asked every man and their dog from the Police to the Fire Service to people from the company from Pike River Coal and others whether there was an emergency plan being implemented and they all gave different answers. So people from Pike River Coal said yes we had an Emergency Plan and we were implementing it and we had people who had the right checklists and were wearing the rights vests to say what was going on, but when you asked the Police and Emergency Services the same question, they all said no, we had no idea Pike River was doing anything. So there was not any degree of co-ordination, there wasn’t any advanced planning and so any business operating in a high hazard environment, there is a real need do we need to think about emergency drills not just with our own people, but actually involving Emergency services from our community and just thinking about how it is they might have to come out. The story that comes to mind for me is oddly enough my father-in-law who, at the time, was working for a company up in Whangarei where they were refurbishing Marine vessels. And they had somebody who was trapped in a confined space and when the ambulance turned up to get somebody out of a confirmed space, they had not actually gone through and practiced and the emergency services personal we not able to actually enter the confined space because it was too small for them. They were larger figured ambulance officers and so the whole process ground to a halt. So it’s great to have an emergency plan, so you know what your response is going to be, but you also need to think about how practicable and what’s really going to happen something does go wrong. Because when it does go wrong it needs to be seamless and ready to go. But if we move a step down now. We’ve responded appropriately for the emergency, and the site is secure, we’ve done our reporting. What is likely to be the next step from the oral and written report being completed – what normally happens then? Grant: Sure well I guess the starting point is the oral report begins on the day and the written notification to the Ministry is then due within seven days. That’s a 1-page form that you can download for free again form the dol.govt.nz website and you might be able to get a link for that as well [posted at bottom of page]. Often the inspectors will be pushing for that to be made available within 24-48 hours. They have no statutory right to do that but given it’s a 1-page form and it’s very bland in what it says, there is often not a lot of downside in doing that. Beyond that, probably the prime consideration is to actually start to investigate internally. So what the legislation requires is that when you’ve had a serious harm accident a business is obliged to investigate and to determine whether a significant accident caused or contributed to the incident. In practice what tends to happen is that the inspectors will want businesses to undertake a full investigation to identify what was the cause of the accident and to give them conclusions that often read like a checklist of practicable steps not taken and identify for the inspector every possible thing could have be done and was not done. That isn’t the legislative requirement and obviously what it does is expose businesses that prepare that sort of report to the potential for prosecution or other enforcement actions. So we say is stop and draw breath and make sure right from day one who are the right people to be involved in an investigation team, and then actually work out what investigation you need to do. And that, generally speaking, require speaking to everybody who was on site and who was a witness to the relevant events and to be speaking to them sooner rather than later. It’s particularly important to balance up talking to the people on the day when their recollection is freshest, to also talking to them when they are under significant emotional stress and strain and their recollections might be somewhat clouded from the emotions of the day. And so giving people a little bit of time and space to gather their thoughts before they then actually commit anything to writing, particularly when giving a statement to the investigation team. And bear in mind when doing that kind of interview process about what it is you are going to write down. The common bugbear I find is people will write down very indiscrete and unhelpful statements that aren’t necessarily bound in fact but are more matters of opinion or heresy because employee number one talks to employee number two who spoke to employee number three and suddenly they all take as gospel what employee number 4 is reported to them as having said or seen, when they haven’t spoken to the other employee and in fact that may not be the case. So it’s really important to separate out the speculation and hearsay from what people actually saw and heard and said and did. Because those are they key things that need to be identified as part of the investigation before you actually get down to write how was it the systems and processes that were in place in the business allowed the incident to occur. Tony: OK great summary of the investigative process there from the businesses point of view. And there are probably varying degrees of capability within a business and to what degree they can gather teams together and what specialist training they have. But lets say they did the best job they could and did everything that you spoke about. I’m interested in the tension there between the regulator and the report that is produced for the business. What rights does the regulator have to request that report given what you mentioned that you could be hanging yourself? Grant: That’s a really good question. In simple terms the regulator has the rights to call for any documents within the workplace that either relate to the workplace or to the employees that work there. The Ministry’s position on that is that it’s a very broad power, it’s fair to say that it hasn’t been particularly well tested by the courts as to what the exact limits of it are. But it doesn’t really matter for particularly small businesses that don’t have a lot of experience dealing with regulators because the regulator will say I’m entitled to your report and I want you to give it to me and will put a lot of pressure on saying make sure you hand it over. Generally speaking what I get clients to do is almost apply a sniff test to it at the start. So you generally speaking will have a bit of an idea right from day one as something that is not likely to excite much interest. Say for example, somebody who is walking across a yard somewhere outside a warehouse and trips over a step and falls down and breaks their wrist, which nobody’s really going to give an awful lot of consideration to. Versus say the Tamahere Cool Store, which exploded and killed a fireman and burned a number of other Fire Fighters where clearly right from day one people knew there was going to be a lot more interest in it. The only way that companies can protect themselves against having to disclose their investigation and report to the Ministry and to the Inspector is if they have done it under the basis it was being prepared so that the company’s lawyers can give them advice on whether they have any liability. And that requires actually engaging lawyers at an early stage so I put in a plug for my lawyer colleagues up and down the country around that. But it really is just a protective measure and isn’t necessary in many cases but the problem we have is that if you don’t at least think about it at the outset, you can’t do it retrospectively. So if you don’t engage a lawyer at the outset and say hey, I’m going to want some advice when this is finished, you can’t magically wave a wand at the finish [of the investigation] and say actually all the things we’ve prepared we now want to put privilege over. Where as it does work in reverse. So at the outset you can say to your lawyer look, I think I’m going to need some advice. Lawyer can say in that case please do a report for me so that I can then consider it and provide the advice as to whether you have a legal liability. And if you go through a process internally and actually decide, we don’t really want to spend money to get a lawyer to do anything once we’ve sorted out and understand for ourselves what happened, then that’s fine. The privilege just falls away. Tony: Right. I think that’s a very important point. Especially if a business is concerned around where this is going because if you do and really are motivated to do a great job to get to the bottom of the problem. And I think most businesses will come from that point of view, they don’t want it to occur again. But on the other hand if they have this real concern, then this is a way to manage the process. Grant: Look I think so and I think from my perspective things have changed just over the last year to 18 months and so while in the past it was really important to have a strong relationship with your local inspectors and to be seen to be a company of any size really who actually looks to be cooperative and to been seen to be somebody who is responsible and doing the right thing, did actually assist Company’s to avoid any enforcement action being taken against them. Even when they might have technically breached their legal duties. Post Pike River and all the criticism that the Department of Labour, as it was then, took about the light handed regulatory approach, we are seeing a far more aggressive stance being taken by Inspectors in terms of saying we are going to do more enforcement actions, but also actually looking to really test the boundaries of their powers and make demands on businesses that are really right on the cusp of whether they have the legal ability to do it. I’m not saying that to be critical of them because clearly their role is to ensure the safety of workers and others involved in the workplace, so they’re really looking to just do their job. But it creates more of a tension then it did in the past and it would be naive I think now for businesses to expect that trying to maintain that cooperative sheen with the inspector is going to be the panacea which means you aren’t then going to face enforcement action. Some of the Inspectors are, frankly a little bit sneaky in terms of trying to develop a rapport with the owners of small or medium sized businesses and be saying look, I just want to make sure you were doing the right thing. And then getting people to say things that are incriminating of themselves, and then saying a-hah! My boss is making me, but I’m going to have to go away and prosecute you and you are going to get a fine and potentially have to pay tens of thousands of dollars or more in penalties. So people do need to be thinking prudently and what is best for themselves and in my view, taking a very measured and often a narrow view about what is it they are going to disclose. Having said all of that, it is still really important to at least give the appearance to be cooperative with the inspectors. There is any offence for obstructing an Inspector and you don’t want to get into a situation where that is either threatened or becomes an actuality, to the extent that the Inspector is making reasonable requests and the requests aren’t going to involve you saying anything that is going to incriminate, then there’s no reason not to cooperate. Because the starting point is both the employer and also the Inspector are really just looking to actually work out what happened to make sure it does not happen again. So to that point at least we’re all on the same side. Tony: OK so what do we mean by reasonable. Does that mean giving them access to any records you have got or the people for interviews, or where or what are the bounds of reasonable? Grant: It really depends upon the circumstances. So if you take those aspects, people and documents, in terms of documents while the law is not particularly clear on the issue by and large we all work on the basis the Inspector can ask for any documents in the business that is not legally privileged or isn’t going to incriminate you and create some sort of legal liability risk. So that if the Inspectors asks for a document that the company already has, then subject to reviewing it and deciding it’s going to say something unhelpful and see whether there is a justified basis for not disclosing it, then it does need to be disclosed. And that can be right down to the level of an inspector saying he or she wants a copy of an employment contract for an employee. In my experience the inspectors are reasonably good at accepting that sometimes there will be some commercial limitations. So for example, if an employee doesn’t want to have their salary exposed then it may well be that you give a redacted version of the contract that has some bits blacked out. Because it’s a balancing act between privacy and the rights of the inspector. When it comes to talking to people it becomes difficult. Again, there is no automatic right for the inspector to be able to talk to all the people that were on the site at the time an accident happened. I have seen companies say no, we’re not going to give you access to people. It’s fair to say it drive the inspectors crazy and I know of at least one occasion where a company refused to do that, was subject to an enforcement action on the basis that they were obstructing. I don’t think that was well founded but that is what happened. But employees need to be told that they don’t actually need to talk to the inspector if they don’t want to. And the inspectors are in my view are somewhat poor in pointing that out to people and so they put a fair degree of pressure on people saying I want to talk to you I want to understand what’s going on and try and force people to give an interview when they can just say no, I don’t want to talk to you. And so it’s important for employers to be thinking about reminding their employees that they don’t have to talk if they don’t want to. But equally it’s important for them not to be saying, I’m telling you not to talk. Because I think that’s a terrible look and frankly socially irresponsible for an employer to be doing that and trying to keep the employees away. But it might well be the case that what you want to say is yes, we’re very happy for you to talk to our employees but they have been through a very traumatic experience and as part of our role as a responsible employer we’re supporting them at the moment so you can come and interview them at our workplace and we’re going to remind them that they have the opportunity to have anybody that they want present in the interview with them. And that might mean a friend, a family member, a union rep or it might actually mean the company’s lawyer actually sits in to actually protect the individual and make sure they don’t say anything that is incriminating of themself as to anything they did or didn’t do that might have contributed to the accident. Again, that is an issue that causes some angst with the inspectors because their view is that there is a conflict of interest when acting for an employer, and say one of it’s employees. We generally just tell the inspector that well, that’s just the way it is, and any conflict issues are between the employer and the employee. And as long as actually they are all just telling the truth then there shouldn’t really be any conflict between them. But there have been cases where I’ve been involved where a conflict has arisen and we’ve had to stop interactions and say look actually, at this point you now have a conflict. A conflict has arisen and we can’t continue to act for somebody. I did a case last year, which was effectively a he-said, she-said with two guys working on a construction site, where they each blamed the other for an accident that occurred that led to somebody to fall 5 or 6 meters through an unguarded penetration. And once it got to the point where the each wanted to point the finger at the other, the obviously there was a conflict and I wasn’t able to continue assist. But until that point you can actually, as an employer, say to your people look we’re very happy to have the company’s lawyer help you and just remind you of your rights and then it’s really over to you what you have to say beyond that. The advantage of that of course is that it gives the employer an ability to have eyes and ears inside the room and to know what it is that is being said to the inspector so they’ve got a better sense as to what the inspectors approach to the whole thing might be in terms of lines of questioning but also what the inspector’s being told. Tony: Is there anything else in this scenario around workplace accidents that we haven’t talked about in terms of legislation changes being proposed, or anything else I haven’t asked you? Grant: Probably the big thing we haven’t talked about yet is what rights does the inspector have to actually take samples, or do destructive testing. And it may be the case if you’ve got a workplace accident has occurred involving a piece of machinery, for example they are going to want to take photographs or measurements of it, they might want to do some sort of scene reconstruction. Generally speaking they are able to come in and have access to the equipment that was involved in any accident and to have a look and work out for them selves what was going on. But, the employer is not obliged to do a recreation of the accident or try to speculate and recreate what might or might have not gone on. Likewise, to the extent that any destructive testing is required, so if you’ve got a piece of equipment that needs to be broken up, for example, in order to assess why it is that it failed. Normally there will be an opportunity for the owner of that equipment to liaise with the inspector and make sure both sides are represented when any testing is being done. So that there is an understanding what testing processes have been followed and therefore the accuracy or otherwise of the tests being undertaken can be properly monitored and judged on whether they are giving a good and fair outcome. In terms of what the future holds, my expectation is the law is going to largely remain the same, once the Health and Safety in Employment Act is repealed and replaced later this year, bit it is a little bit of a moving feast at this stage. We haven’t seen a lot of recommendations for change from the Independent Taskforce on Workplace Health and Safety in this regard, and the Australian law is broadly speaking consistent with what we have now. But until the end of July when the Government is due to put a bill before parliament, really it’s anybody’s guess. Tony: Grant I think we’ve covered a lot there and maybe if it works out for you, later in the year we’ll get you back to actually talk about the changes that have actually occurred in the HSE Act. Grant: I’ll be happy to Tony, not a problem. Tony: So generally we’ve talked about preparedness to me that came through well and truly that you need to actually be prepared and practicing your emergency response and communication plans. Grant: Yeah, and with no hint of self-interest, that’s definitely the case. That doesn’t mean though you actually need to have your lawyer running the investigation process or doing it all for you. That would sometimes be appropriate and expensive and lawyers don’t always have the right skill set to be doing it. It may well be best to do it within the business, or engage a specialist H&S practitioner from outside who can come in and have a look and help you with that, where you get some pricing certainty with what’s going on with it. Probably the fundamental thing from my perspective at least when you do an investigation report is thinking about firstly making sure it doesn’t come across as just blaming the victim. That’s a common trap that people fall into because for inspectors generally speaking they don’t want to hear it’s the victims fault, we had perfect systems and they just managed to circumvent them. Because the fact that you can circumvent them rather indicates they weren’t working in the first place. Tony: Exactly. Grant it’s a very complicated and complex area. If people need to get hold of you for more advice, how do they go about doing that? Grant: Sure, I’m always happy to speak to someone on the phone and if there’s a quick question somebody wants to ask me and I can give a quick answer I’m happy to do that, as part of my contribution to the Health and Safety community. Probably the best ways to get hold of me are either on my mobile, which is always on 24/7 given the nature of Health and Safety, that number is: 021 378 524 or alternatively you can email me here at my Auckland office which is grant.nicholson@kensingtonswan.com And I’ll be happy to speak to any of the listeners about any issues they have got. Tony: Hey thanks Grant for coming on and hope to talk to you later in the year. Grant: No problem Tony, take care.